Christmastime brings out the “kid” in my kids. I guess in some ways it brings out the kid in all of us. I get overwhelmingly giddy about all the Christmas fun, and I’m…not a kid. I knew they were (mostly) kidding, but still the idea of creating some sort of special Christmas countdown for them sounded like a lot of fun. I especially wanted to do it because after we had our conversation, they pretty much thought I would forget about it and not do anything. Ha! I’ll show them. It’s fun to be rebellious toward my teenagers. After I read this, I couldn’t stop thinking about it. I mostly focus on the birth of Jesus during the Christmas season. How lovely to think about how Simeon and Anna eagerly sought to meet Jesus on earth after his birth! I opened my Bible and searched for more instances where people sought after Jesus. So many people from so many different situations recognized their need for Jesus. Their stories are beautiful – so filled with faith. THIS is why Jesus came!! To heal! To cleanse! To bring salvation. To be truth. To meet the needs of each one who seeks Him. To bring peace. To be joy. During my study that day, an idea for a Christmas count-down began to form. In my excitement, I could think of little else. I wrote down 12 situations in the Bible where people saw their need for Jesus, sought Him out, and encountered His fullness. I decided that our family could read one each day for 12 days, beginning December 13 – counting down the days until Christmas. One idea led to another as I thought of ways to make this more memorable and meaningful for our family. I turned the scriptures into decorative cards. I attached the cards to 12 lunch-sized sacks. 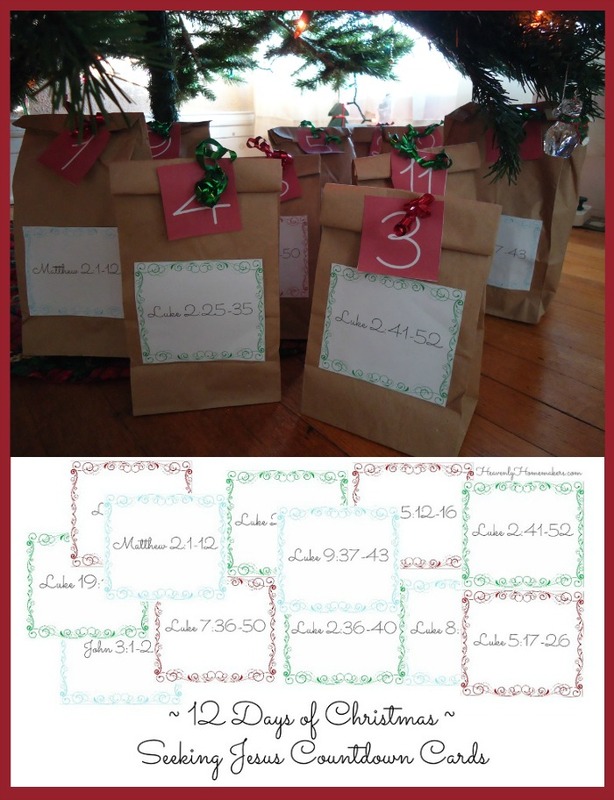 Beginning December 13, we will open one sack each day after we read and discuss the scripture. Inside each sack, I have included an item that relates to the day’s reading. Some will be treats for us to enjoy, some will be something we can share with others, some will simply be symbolic. I’ve written the details below in case you’d like to do something similar with your family. 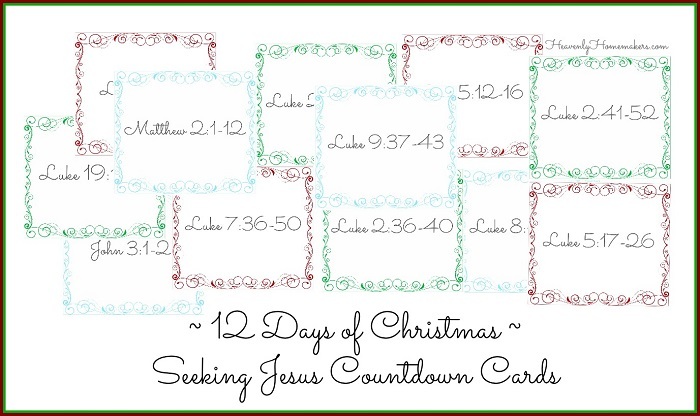 Ready to download the ~12 Days of Christmas ~ Seeking Jesus Countdown Cards? Click here to join our Learning Zone. All members of our Learning Zone will get continual FREE access to these cards and many more seasonal family learning resources! I keep getting choked up and teary eyed as I anticipate sharing this with my family. I have such a desire to make Jesus a bigger part of our Christmas celebrations, and I can’t think of a better way than to celebrate with 12 Biblical examples of people who came eagerly seeking Him during his time on earth. May we also be inspired to eagerly seek Jesus daily for our comfort, healing, peace, and joy! Here are the scriptures I chose, as well as details about what I included in each sack. The story of Anna seeking Jesus in the temple. The bag contains a 2016 mini-calendar. This will represent how Anna worshiped in the Temple night and day for years and years. It will remind us that our daily lives are also to be worship. The story of Jesus’ parents looking for Jesus and finding him in the temple. This sack is empty! Once the boys discover this, they will have to do a search through the living room to find a treat I’ve hidden. This represents Jesus’ parents searching for him on their journey. The story of Jesus healing a leper. This bag contains a new snowman soap dispenser. This represents “cleansing” as described in the story. Other ideas include fun bars of soap or cute washrags. The story of Jesus healing the paralyzed man on the mat. I found a fun Christmas place-mat and folded it up (carefully!) into the sack. I also included a small treat we can eat after we put the new mat on our table. The story of the Centurion seeking Jesus to heal his servant. Because Jesus healed the man’s servant, I’ve included a service opportunity in this sack. I put two muffin mixes along with some Christmas paper liners for the boys to make and deliver to someone. The story of the woman who washed Jesus’ feet with her tears and poured perfume on them. I put two bottles of essential oils in the sack for us to use in our diffuser. All day the smell of the oils will remind of us of this story of forgiveness. The story of Jairus seeking Jesus to heal his 12-year old daughter, and Jesus healing the woman who had been sick for 12 years. I added 12 chocolate candies in the sack to share as the number 12 is a significant number in this reading. Plus, there was much to celebrate with these two healings! Chocolate seemed appropriate. The story of Jesus healing the demon possessed boy. This one is a little bit silly, but my big boys appreciate being silly quite frequently. Picturing the joy of the boy who was healed by Jesus, I put some goofy toys in the sack for our boys. Straws with mustaches? Why not? The story of Zacchaeus climbing a tree to see Jesus. Since Zacchaeus was a tax collector who turned his life around, I put some cash in the sack. Our family will decide together how we would like to donate this money. The story of Nicodemus coming to Jesus at night to learn from him. I got a new string of Christmas lights for our boys to hang in their room as a reminder of Jesus words, “But whoever lives by the truth comes into the light, so that it may be seen plainly that what they have done has been done in the sight of God.” Other ideas include glow lights or bracelets. The story of the Magi following the star to find Jesus. I found a new star-shaped ornament for our tree. This will be the final bag we open on December 24! ~ Reading chronologically is nice, but I’m actually mixing up the scriptures and stories and doing them with our family in a different order than listed above. ~ I purchased almost all of these items at our dollar store or used what I already had on hand. I wanted to make this special while keeping the cost down. Win-win. ~ The free download includes number cards if you’d like to use them too. I simply folded over the sacks and stapled on the number card along with a little curly ribbon. Join our Learning Zone here for free access to these countdown cards and many more family resources! How interesting! This will make studying Jesus’ birth and life more interesting and fresh! It is interesting that my personal bible study took me to the crucifixion and resurrection of Christ. The people who tie into this are the thief who would be with Jesus that day in Paradise and Mary Magdelene and Mary & Peter & John searching for him at the tomb after he was resurrected. I love this! Thank you so much for the idea and the free download. Am very excited about doing this for my children as well. Thanks for sharing the fruit of your prayers with us! May it bless your boys greatly. That is the best idea I’ve heard of in a long time for an advent calendar! I love the idea of using examples of people who sought Jesus after he was born, I’ve never thought of that before. I love the saying “wise men still seek him” and feel like this really illustrates that. Thanks so much for putting this together, I will definitely be using this! This is a beautiful idea. I hope it’s okay that I shared it with my Homemade Christmas FB group. I love this idea! Except that I think I’ll use it to celebrate the 12 Days of Christmas instead. I’ve found, in the past, that we often spend so much time celebrating advent that we forget that the big celebration time is Christmas. We still do many of the advent traditions in our house, but we make it a point to save the big time treats and celebrations for the 12 Days of Christmas and this will fit in perfectly. Thanks so much for the free downloads! Very much appreciated! An excellent idea for “kids” of all ages! It’s creative, fun, and instructive. Thank you! This is an excellent idea Laura. Just what I was looking for! I bought some stuff today to do this with my girls. Thanks for the awesome idea! This post must’ve taken you a very long time to write. I so much appreciate the time you have spent in providing me with this special blessing. My children are grown but this gives me new perspective with an advent calendar and I know my grandchildren will benefit from this. Thank you Laura for allowing God to work through you and for being obedient to His will. 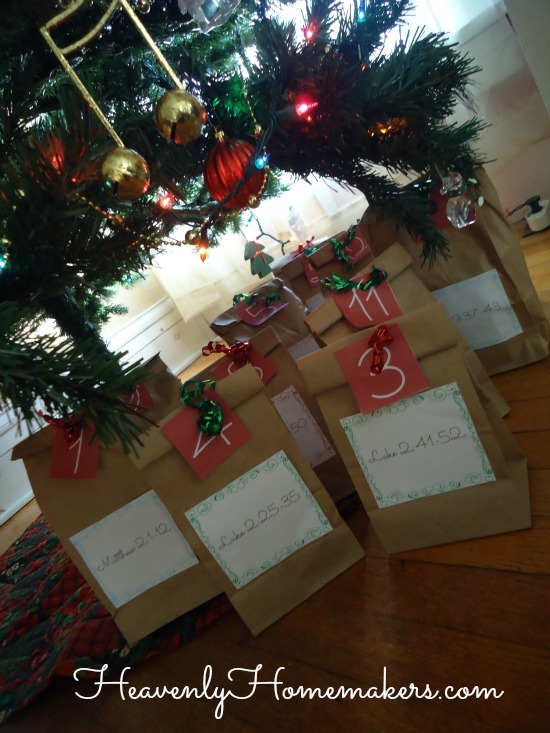 Thank you for this….we are using it and the kids can hardly wait to open their bag each day…..although I think they were hoping for candy in every bag:o) At 6 and 8 they have a hard time thinking beyond themselves. Thanks for all the work you did for me….. Thank you for sharing this! We have been doing it with our family, and each night our kids (2,4,6,8) are excited about our Seeking Jesus time. It was wonderful to me when our 8 year old asked if he could read the Scriptures out loud. Last night we did our service project. We made five treat bags (fewer neighbor’s in the country) with a variety of home made goods, a Christmas letter from our family, and a copy of Luke, chapter 2, along with a picture of Mary and her baby boy. We then bundled up (20F degrees here), and went caroling to our neighbor’s, handing out the bags. It was our first time doing this, and inspired by your 12 days of Christmas suggestion. All four children loved it, saying it’s the opposite of Halloween as we are giving rather than receiving. They are asking that we do this Scriptual countdown to Christmas every year. Thank you! And Merry Christmas! I did something similar a cople of years with the Christmas Little People. I wrapped them in 20 individual packages and we read Scripture and opened one each day leading up to Christmas–ending with the baby Jesus in the last one of course. Great idea and great implementation. Curiosity… I always thought the 12 Days of Christmas went from December 25 to January 6, which is the Epiphany, when the wisemen visited Jesus and I always thought the song called the 12 Days of Christmas was all about the persecution of Christians in the early days of the Christian church. The Partridge in a pear tree is Jesus Christ and each of the other versus reflect something that was relevant to the faith at that time. It allowed them to celebrate their faith without being discovered by the Romans. Does anyone else know if this is accurate? Of course, it doesn’t really matter as long as we are all just celebrating Jesus. Yes, that is true that the 12 Days of Christmas begin on Christmas and the song numbers reflect Biblical symbolism. I think all Advent traditions, such as the one here, that focus on growing closer to the Lord Jesus are wonderful. It saddens me, however, that we are losing the tradition of the real 12 days. The church for centuries has celebrated Advent (the church calendar’s “new year”) as a season of spiritual preparation for the Incarnation of the Christ Child, as well as the Second Coming of Christ. The Christmas season begins on Christmas, with Christmas Eve services/masses. In some churches the Christmas season goes through the Baptism of Our Lord Feast day. Keep celebrating through the real 12 Days:)! (even more days of some Christmas treats and beautiful sacred music!). Advent/Christmas blessings to all!!! I love this! I’m planning to use it for the 12 days between Christmas and Epiphany (Jan 6–the original 12 days of Christmas!) to extend our celebration of Jesus this year. Thank you so much for these amazing ideas!! I can’t wait to do these with my boys! We do have a scripture/piece of chocolate advent calendar we do in Dec but I think these bags will be even more memorable! Do you do these same ones every year? Thank you for sharing your neat ideas!! We did your countdown last year with our 5 year old son. I prepared the bags and my husband read the scriptures and discussed them with our son. Then our son opened the coordinating bag. When we reached the last bag, both my husband and my son asked me to continue this for all of the holidays. So… do you have a new advent for this year? 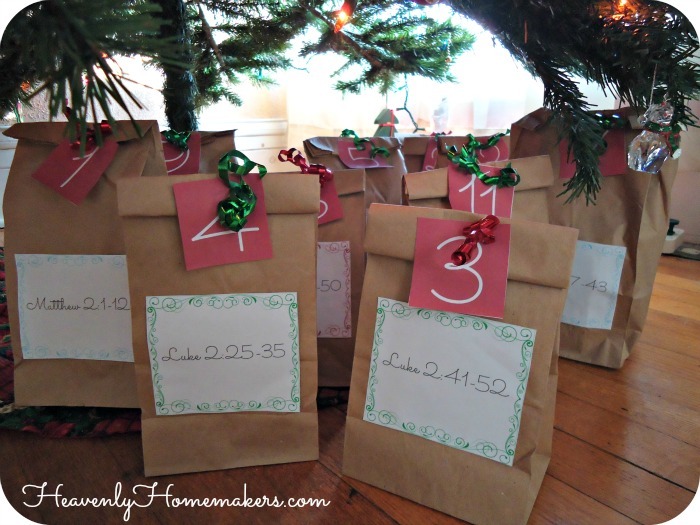 Will you make an advent like this for the different holidays, especially Easter? I love the idea, and I’m not sure I’ll be able to pull it off this year. But I’ll chew on it and see what I can do!